Many anticipated the public release of evidence that a grand jury considered in its decision to not indict Officer Darren Wilson who fatally shot Michael Brown. 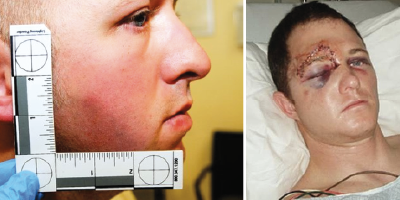 Photos of Officer Wilson revealed no serious injuries. Yet, an exit poll of voters in the 2014 November elections in Ferguson, Missouri illuminates the racial polarization of beliefs that Officer Wilson was seriously injured by Brown. Tyler Chance and Dawna Williams, two doctoral students at the University of Missouri-St. Louis, recently administered exit surveys at four polling places in Ferguson, MO on November 4. The timing of the exit poll is important, since it occurred well before the release of information on the shooting. The exit polls were administered in two precincts in predominantly white neighborhoods and two precincts in predominantly black neighborhoods. Violent tragedies ...[typically give] whites the impression that racism is an unfortunate accident in a society steeped in civil rights history while people of color continue to understand racism as rather structural and quite unexceptional. In total, 129 people participated in the exit survey. A majority of respondents self-identified as black (58 percent); over a third identified as white (35.5 percent); and, a handful of respondents identified either as Asian, Latino, or Other. 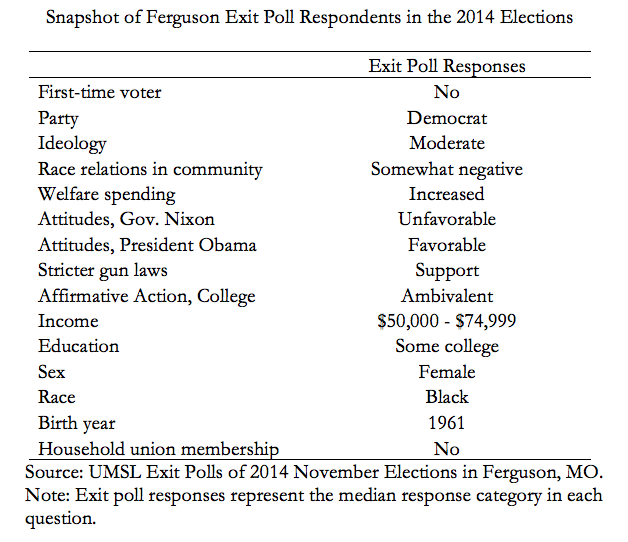 Other demographics and political attitudes of exit poll respondents are provided in the table below. Indeed, we fully acknowledge the limitations of exit poll data; nevertheless, the survey does serve as one of the few polls to focus on Ferguson residents’ attitudes toward police after the shooting of Michael Brown. Examining different beliefs about what “actually” happened between Officer Wilson and Michael Brown sheds more understanding of how race inflates perceived aggression of criminals and victimization of police officers. A majority of white respondents (71 percent) believed that Officer Wilson was seriously injured in contrast with only a few black respondents (9 percent). This is particularly interesting, since state authorities took great efforts to withhold any information on Officer Wilson’s condition until after the grand jury decision (though some social media contributors attempted to provide their own false pictures of an abused white police officer that wasn’t even Wilson). As controversial issues provide multiple meanings for mass public interpretation, some research on motivated skepticism suggest that citizens may search for details of police shootings in such ways that are consistent with their political beliefs. In an ongoing study, Tyler Chance, Dawna Williams, David Kimball, and I are interested to further understand the extent to which citizens will search for information concerning police shootings to further support their prejudicial beliefs toward people of color. 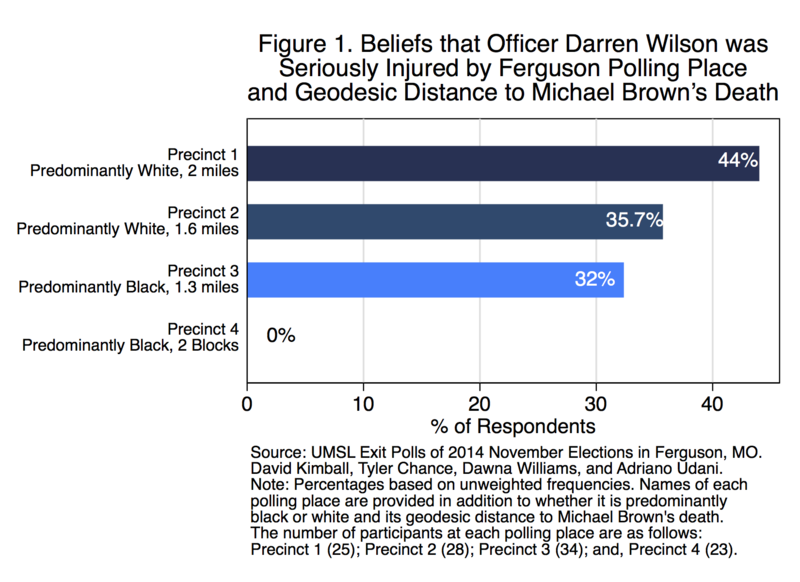 The exit poll data also suggest that the racial composition of local precincts and proximity to Michael Brown’s death also play influential roles in shaping beliefs among exit poll participants. Figure 1 shows the percentage of respondents in each Ferguson polling place who believed that Officer Wilson sustained serious injuries. The name of each polling place is removed to protect respondent anonymity. Each polling place, though, is coded as either predominantly white or black, and the percentages of respondents are further organized in descending order according to its geodesic distance from Michael Brown’s death. As the distance from the police shooting increases, the percentage of respondents (primarily white residents) who believe Officer Wilson was seriously injured increases. Even more striking, none of the respondents who live near Michael Brown’s death (all of which are black residents) believed that Officer Wilson was seriously injured. Information about the factors that lead to police homicides poses dire consequences for U.S. democracy. To clarify whether racial animus fuels police shootings in the United States, citizens would only need to consult a comprehensive report of the racial breakdown of police homicides. Yet, as a recent New York Times article discusses, estimations of police shootings still vary widely. Amidst the dearth of reliable sources on police shootings, citizens often rely on public discourse – witness accounts; official statements of the police precinct; local media coverage, and opinion leaders – to formulate their own evidence to assign blame for the loss of life. Such information channels and the institutions that sustain them – that Joshua Tucker and Clarissa Hayward have already productively discussed – raise consequences for mass political attitudes, as negative stereotypes of black youth in the media can reinforce perceptions about the legitimacy and deservedness of fatal police treatment of marginal populations. To this end, in the wake of President Obama’s recent push for increased funding for police to wear body cameras, we suspect that citizens will employ different narratives to “police the police.” Our exit poll results show racial differences in attitudes toward making the discretionary actions of police more legible. Majorities of white and black respondents believe that police should be required to wear body cameras. Nevertheless, fewer white (80 percent) than black respondents (94 percent) support police wearing body cameras. Some studies suggest that the overwhelming support among respondents to require police to record their behaviors on video reflects a racialized understanding of the state’s capacity of policing deviant behaviors. That is, from a position of race privilege, whites are more likely to believe that police are ill equipped to defend themselves and need proof that officers conducted themselves within the norms of procedural justice. In contrast, blacks may support body cameras in hopes of building evidence against a surveillance state that both inadequately protects and coercively violates them. Violent tragedies in the United States bring momentary public attention to inequality, which typically gives whites the impression that racism is an unfortunate accident in a society steeped in civil rights history while people of color continue to understand racism as rather structural and quite unexceptional. As other communities across the United States join a national movement to raise awareness of their own experiences and tragedies from forcible police treatment, Ferguson should be understood as neither exceptional nor disconnected from other communities. Rather, the fact that controversy surrounding Michael Brown’s death still remains – whether he had his hands up; whether Officer Wilson was defending himself – should serve as a constant reminder that U.S. mainstream society remains skeptical of black experiences while exonerating white privileges in America. 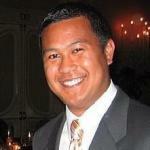 Adriano Udani is an Assistant Professor of Political Science at the University of Missouri – St. Louis (UMSL); Tyler Chance and Dawna Williams are doctoral students in political science at UMSL; and, David Kimball is a Professor of Political Science at UMSL. Featured Photo: Combination of viral (fake) image and official image of Officer Darren Wilson.